An Australian family struggles to mend its rifts in time and space. There is no doubt that Ethan Forsythe is a unique and brilliant 12-year-old boy. Though he's not on the autism spectrum, he seems to possess the qualities of a savant: he appears to see the physics of our world, from sound waves to velocity. While one might think that unlocking the secrets of the universe would be cause for celebration, for Ethan, these abilities appear to stem from a brief, violent act that occurred when he was an infant. In an instant, both Ethan’s brain and his family were irreparably altered. Over the years, his mother, Claire, has sacrificed both her career as a ballet dancer and her marriage to protect young Ethan from the truth. All the way across Australia, Ethan’s father, Mark, has attempted to erase the tragic events from his mind. But when Mark learns that his father is about to die, he ventures back to Sydney and back into Ethan’s and Claire’s lives. Together, they cautiously dip their toes into family life as they try to make sense of the past and speak honestly of the one tumultuous moment that ripped them apart. Though troubled, Mark is a multifaceted and complex character seeking redemption. Though hurt, Ethan and Claire approach him with a gradual softness. 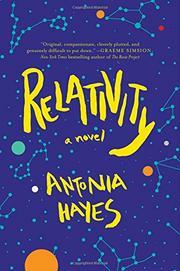 While Hayes is often quite successful at weaving the language of science through her prose, occasionally the references appear stiff and forced. The narrative is strongest when the characters interact earnestly with one another, as a broken family trying to forge new bonds, instead of when the moments between them are analyzed and dissected. This is a family that the reader can root for. A charming and fresh debut placing a family’s secrets in the great expanse of the universe.